Yes, of course. Thanks for reading and for the kind words. I’d be honored if you use this in any way. I love #9! I am a foster mom, and I think it would be wonderful to throw a party in Jesus’s honor that would benefit the children who come into foster care in our community. Thank you for this wonderful idea! Glad to know that someone else does not find Happy Holidays offensive. My husband and I will ring the bell occasionally for the Salvation Army, and they want you to say Merry Christmas. I prefer Merry Christmas, but when I am soliciting for money in a public place, I say Happy Holidays as I don’t know what religion the person coming out of the store is. I figure it is more Christian to say that than offend someone. Re: “Happy holidays.” No. Don’t get mad. Simply look at them and say, “Why one?” Ask them to be specific. Listen to what they have to say. Then wish them “Merry Christmas!” If they ask why, share with them how Jesus has made a difference in your life. This works well with just about anyone, even someone who is looking for Christ. The public schools are a wasteland. In this a broadly left-wing liberal educational establishment has effectively used the public school system as a tool by which to advance their political and social agenda. Of course they exclude Christ or any mention of Christmas, etc. from the public school system. It would be a threat to their agenda. These are great ideas. We often advocate that “we may be the only Bible some people will read”. What a great time of year to add some emphasis and urgency to this. Thank you for a terrific post! I love this although I am not “religious”. Re. Happy Holidays…. we have always said this! Growing up in the US, it meant Happy Thanksgiving, Merry Christmas and Happy New Year! It is not meant to denegrate Christmas! I love these ideas. I’m sharing this with my FB friends and other colleagues. I am touched by #5 and #6. Also enjoyed your Lenten Disciplines of letter writing. Thanks for sharing such excellent material. Excellent. Christians can sometimes respond to “Happy Holidays” in very un-Christ-like ways. This is full of great ideas. SCHOOLS are for teaching kids to THINK. CHURCHES, HOMES and PARENTS are for teaching kids to PRAY. If critical thinking threatens your religion, then there’s something wrong with your religion, and not with critical thinking. Hi. 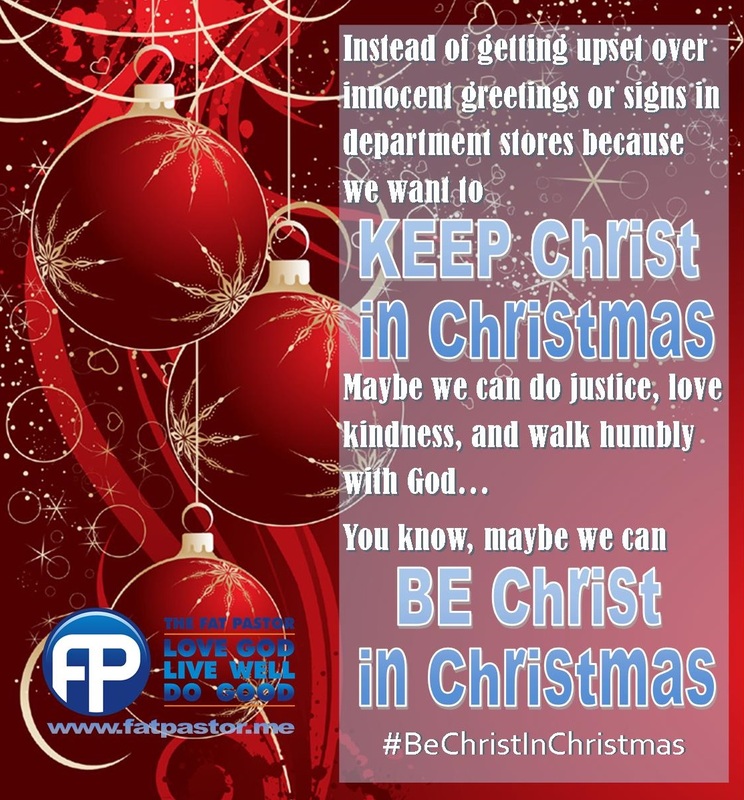 I saw you on a #chsocm chat and had to read about the #beTheChristInChristmas. I am doing a blog post where I am reflecting on this topic and wanted to share a link to your article and use your image “nothing can take Christ….” please let me know, Thanks @embeddedfaith. Re: Schools…thinking, etc. The issue is not that schools are for teaching children. It is that schools have been used as tool by which a left-wing liberal educational establishment has pressed its own social and political agenda without any regard to the will of the parents whose children are subjected to this “teaching” in the schools paid for by the parents. At issue is the effort of hostile secularist to force Christian faith into a ghetto, the force Christian faith and practice behind closed doors. At issue is that those fearful of or overtly hostile to Christian faith presume to be the ones who are to validate what they suppose to be critical thinking excluding any other thinking which they deem not to meet that standard. Public school teacher here. Bthomas has shared his experience so here is mine. As a student, a parent, and a teacher the public school experiences of bthomas are certainly in keeping with my experiences. I also have charge of Christmas programs. There is always a sacred piece of music included in my programs. It is part of educating the public. An educated person should know the origin of Holy Days…what we now call holidays. It is up to parents and adult individuals to decide which holidays they practice in their homes. In the last 4 years at my teenagers school concerts and at my elementary concerts, I have heard the following music: Hallelujah Chorus, Carol of the Bells, Dormi Dormi (sacred Italian carol), Salvation, Rise Up Shepherd and Follow, o Come Little Children, and various African Noels. These are the ones I remember. There were actually more. The quality of the high school sound was collegiate and my little kiddos are pretty awesome too! At my son’s Christian University, there will be a couple of “secular” carols on the December Concert. I grew up going to church and hearing “Seasons Greetings” and “Happy Holidays” always assuming it referred to the New Year Celebration as well as the 12 days of Christmas. It was never an issue until I was in my 30’s. Hello! Thank you so much for writing this and sharing your thoughts! I really appreciated this, as I’ve had issues with people who instead scream to keep Christ in Christmas all day everyday. I’m fine and totally agree with everything up until you say “the former.” Shouldn’t former or first be the bad chocolate not the books? And then the same with “latter” shouldn’t that be the books not the chocolate? I guess my question boils down to if my understanding of former and latter is wrong, in which case I severely misunderstood this seventh point because I thought you didn’t like the chocolate, or if you simply made a very human error and switched the two, which is super easy to do and does not reflect poorly on your writing or thoughts if that’s what happened. Please tell me if you think I’ve blown up at you. I really do not want to come across that way, because I think this is a fantastic blog post and grammar is not the primary issue here, I just want to make sure I’m understanding your opinions correctly since grammar is making it fuzzy. haha soooo fun! this is beautiful. I am a pagan (Druid) and even I can get behind this. I accept a “merry Christmas” from my many Christian friends (who accept me, as I accept them, because we are all good, generous, loving people who do good works) with the spirit it is given. I say “Merry Christmas” on December 24th and 25th (and January 6th, as I am part Ukranian), Happy Yule on December 21st, and Happy Holidays the rest of the time. It is far more Christian to treat others with love and kindness than to treat them rudely. Sometimes I think I show more Christian traits than half the people I see claiming to be Christian (who are really following Paul’s teachings, not Jesus’).